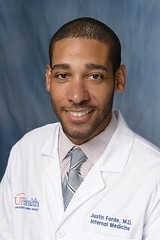 Post written by Justin J. Forde, MD, from the Department of Medicine, University of Florida, Gainesville, Florida, USA. The role of endoscopic submucosal dissection (ESD) in Barrett’s esophagus (BE) is not well established. This meta-analysis aimed to evaluate the safety and efficacy of ESD for the management of early BE neoplasia. ESD is an advanced technique that allows the en-bloc resection of lesions in the GI tract irrespective of size, thereby providing accurate histopathological evaluation. There is increasing evidence supporting ESD as superior to EMR in terms of higher en-bloc, curative, and lower recurrence rates for the management of dysplastic lesions and early cancer. Data on ESD for the treatment of BE neoplasia has been limited. Eleven studies (501 patients, 524 lesions) were included in our meta-analysis. Mean lesion size was 27 mm (95% confidence interval [CI], 20.9-33.1). Pooled estimate for en-bloc resection was 92.9% (95% CI, 90.3%-95.2%). The pooled R0 (complete) and curative resection rates were 74.5% (95% CI, 66.3%-81.9%) and 64.9% (95% CI, 55.7%-73.6%), respectively. There was no association between R0 or curative resection rates and study setting (Asia vs West), length of BE, lesion characteristics, procedural time, or length of follow-up. The pooled estimates for perforation and bleeding were 1.5% (95% CI, .4%-3.0%) and 1.7% (95% CI, .6%-3.4%), respectively. Esophageal stricture rate was 11.6% (95% CI, .9%-29.6%). Incidence of recurrence after curative resection was .17% (95% CI, 0%-.3%) at a mean follow-up 22.9 months (95% CI, 17.5-28.3). Our study demonstrates that ESD for early BE neoplasia is associated with a high en-bloc resection rate, acceptable safety profile, and low recurrence after curative resection. 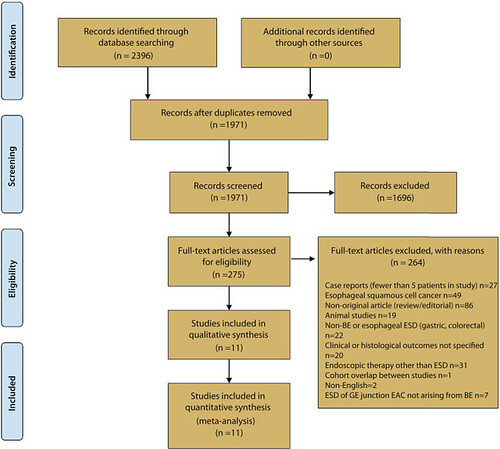 Prospective trials comparing ESD with current standard modalities (ie, EMR and endoscopic ablation) are needed to better define the role of ESD within the treatment algorithm for Barrett’s neoplasia. Careful lesion characterization and selection may play a crucial role in ensuring complete and curative resection.